Healthy butterfingers are candy bars that defy all logic. They are perhaps one of the most underrated chocolate candy bars in the market. Many people claim that they are palatable and nothing more. My homemade raw butterfingers have the same toffee-like crunch as do the commercialized butterfingers, but unlike the original version, these butterfingers candy bars are whole grain, high in iron, and completely void of high-fructose corn syrup. Plus, the filling does not stick to one’s teeth as much. Learning how to make homemade butterfingers is not a far stretch from making homemade snickers bars. The methods are quite similar and the flavors are comparable. This vegan butterfingers recipe does not get any easier. Unlike many vegan butterfingers recipes, mine does not require any cooking. Peanut butter and peanuts are recommended for this recipe, but you can use almonds and almond butter if you have a peanut allergy. Pulse the bran flakes, corn flakes, or dried white mulberries in a food processor until crumbly. Add the remaining six ingredients and pulse until large, sticky clumps form. Add more agave or syrup if the dough is not holding together. Pour the dough and spread it out evenly onto a prepared 8×8 pan. Cover and freeze for 15-20 minutes, or until firm. In the meantime, melt chocolate chips, in a microwave or over a double boiler, and set aside. Remove the dough from the freezer and cut into bars while they are still in the pan. Gently pour melted chocolate over each bar. Return them to the freezer and freeze for an hour before serving. Store them in the freezer if you wish to retain their crunchiness. Sweet or savory, spreads are very addictive. Put a bowl of crackers and a spread in front of me and they both will be devoured within minutes. I never cared for store-bought chocolate spreads. Overall, I find them to be too sugary for my liking. Nutella happens to be on the top of my favorite spreads, because the sweetness is not as overpowering. The lack of sugar, minuscule amount of oil, and natural ingredients are what set this homemade chocolate spread apart from most chocolate spreads. This chocolate spread takes minutes to make and can be used as a chocolate frosting or icing. Adjust the measurements in the following ingredients depending on the consistency you like. You can even add a nut spread to the ingredients if you like. Melt the coconut oil or margarine, either in the microwave or in a warm oven. Add agave syrup and vanilla extract and stir. Add cocoa powder. Add a bit of water if spread is too thick. 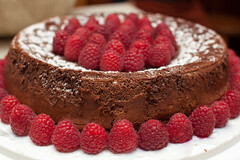 A few months ago, I read a recipe for a flourless chocolate cake on the wonderful Seattle Foodshed blog. I bookmarked it, and decided that Pesach was the perfect time to try it out, as for kitniot eaters, it’s completely Kosher For Passover and pareve to boot. And who would have thought that a cake that’s Kosher for Pesach and made from hummus would originate in the US? So with a few days left of Pesach, I have to share this with you. I just baked it, and it’s a hit. My kids piled into it, and were shocked when I revealed to them that it’s made with chickpeas instead of flour. 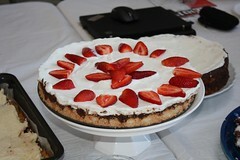 My husband asked where the matbucha was… I will definitely make this cake again for Pesach. It turns out like a brownie cake, so you can also make it as bars, and serving it with ice cream would not be a tragedy. As I was writing this recipe, I realized I had forgotten to add the baking powder, but it came out fine! So if you can’t find Kosher For Passover baking powder, you can leave it out. Now I will have to bake this again to see what it turns out like with baking powder! I will share this recipe with you here as well, but do visit the Seattle Foodshed blog, as there are also lots of good, healthy recipes there that are worth checking out, and the pictures are great. In a food processor, mix the chick peas and eggs until smooth. Add the vanilla, sugar and baking powder (if you can’t find baking powder that’s KFP, leave it out) and pulse till combined. Melt the chocolate over boiling water (double boiler). Add the melted chocolate to the cake mix and combine. Line a 22cm (9 inch) baking tin with baking paper and grease. Pour the mixture into the tin and bake for 35-40 minutes. What should you do with all that uneaten Hanukkah gelt lying around the house? Prepare some chocolate fondue! It is the perfect dessert for a cold winter evening. Place the chocolate gelt in a double boiler on the stove. Stir the chocolate until it melts. Incorporate the cream into the melted chocolate. Pour the chocolate liqueur in, and stir until the mixture is smooth. Serve with fresh berries, sliced bananas, cut up mango, kiwi, pineapple, and clementine segments. Note: You may substitute the heavy cream with almond or coconut milk for pareve fondue if using pareve gelt. The first homemade chocolate gift Jody Peskin ever made was an Old World chocolate Easter egg for each of her non-Jewish friends in college. It was a lovely gesture, as they had been participating in her Shabbat dinners all year. “I used real chicken eggs,” she told me. “I poked a hole in each one, emptied it, then boiled the shells to kill all the bacteria. Then I filled the egg with melted chocolate.” This self-declared “chief chocolate officer’s” passion for all things chocolate has led her to open The Sweet Trading Company. Only the finest kosher Belgian chocolate is used at The Sweet Trading Company. Every day there is a freshly prepared selection of chocolate delicacies to choose from at the store. Ms. Peskin also creates custom confections for special occasions. When I stopped by, she had fashioned chocolate lollipops with both elephants and donkeys in honor of the presidential debate. Have you ever fantasized about making your own chocolate delights? Jody Peskin is planning to offer chocolate making classes and themed parties. She intends to organize hands-on crafts in celebration of the Jewish holidays. The Sweet Trading Company is the Philadelphia area’s first kosher producer of artisanal chocolates. With its separate dairy and pareve chocolate kitchens, it is supervised by the Community Kashrus of Greater Philadelphia. Whether you are planning to treat yourself or send a gift, The Sweet Trading Company will help you select something that is delicious, appropriate, and kosher. Hours: Mon – Fri:	10:00 am-6:00 pm, Sun:	11:00 am-5:00 pm. Parking: Street or parking lot.